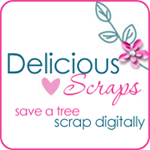 Delicious Scraps: Happy Valentine's Day!! thanks a lot. Love the combination of purple and pink! I just wanted to say thankyou SO much for all you do. I love the little stringy heart flowery thing. THANK YOU!! What a fantastic Valentines gift-thanks so much ! This is beautiful, I love the colors! Thanks so much.